Carol and Ken Bello entered the Vilna Shul sanctuary last week. Her great-great-grandparents were members. 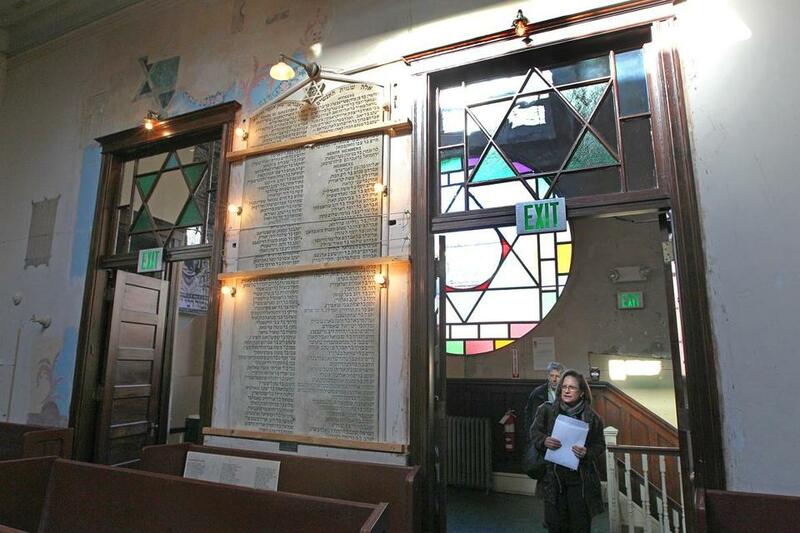 Barry Oshry stood in the sanctuary of downtown Boston’s last intact immigrant-era synagogue, the Vilna Shul, clutching a sheaf of photocopied documents. His eyes filled with tears. He held a copy of his father’s 1897 petition for naturalization. David Oshry had come from a village in Lithuania with his younger siblings, crossing the ocean to Canada, and then traveling by train to Boston at age 16. Oshry lived most of his 81 years in Boston without knowing he had a connection to the Vilna Shul — or that the synagogue even existed. It was only when he got a call from a board member and amateur genealogist, Marilyn Okonow, who was tracking down descendants of the shul’s original members, that he learned his grandfather, who had arrived a few years earlier than his children, had been an original member. Last week, he was one of about 90 descendants of the shul’s first members who gathered, with their families, to learn about their ancestors’ first years in Boston — and Boston’s early Jewish history. From about 1880 to 1924, thousands of Jews from Central and Eastern Europe came to the city fleeing rural poverty and seeking freedom from religious persecution. At one point there were 53 synagogues in the city, according to “The Jews of Boston.” Many of them were in the heart of the downtown, but they closed as Jews made their way from the tenements of the North End and the West End to Mattapan, Dorchester, Roxbury, and the suburbs of Boston. The roots of Vilna Shul, located on Phillips Street on the back side of Beacon Hill, date to 1893, when immigrants from Vilna, Lithuania (now Vilnius, the capital), and surrounding villages formed a community that worshipped together. They bought the former 12th Baptist Church on Phillips Street and transformed it into a synagogue in 1909. But after the city took the building by eminent domain in order to expand a neighboring school, the congregation used the $20,000 compensation it received to build a brick synagogue with a large Star of David window just down the street. The new shul opened in 1919. It closed in 1985, and was for a time set to become a parking lot. It was rescued in the mid-1990s and reopened as a Jewish cultural center. Today, the Vilna Shul hosts educational and cultural events, High Holiday services, and rents its space for community and organizational gatherings, weddings, bar and bat mitzvahs, and other Jewish “lifecycle” events. Once a month, a group of mostly younger Jews holds Shabbat services there. But until very recently, little was known about the shul’s original members. There were no surviving paper records, just plaques with the first members’ names etched into them. The West End, where many in the congregation lived, had been razed in the late 1950s and early 1960s in a vast urban renewal project. Okonow, of Needham, and David Rosen, of Boston, another board member with an interest in genealogy, decided to see whether they could connect with descendants of the founding families. They began with the most unusual surnames and, using census records, newspaper clippings, and immigration records, started tracking about 30 families, and seeking out their descendants. “It was a total labor of love,” Okonow said. “In a sense, we are rededicating the Vilna Shul, with you being here today,” she said. The descendants —seated in the deep pews from the old 12th Baptist Church, which the founders stripped of crucifixes and repurposed for their synagogue — regarded one another. They were strangers, but their forbears had been neighbors, friends, business associates. They were butchers, grocers, bakers, tailors, cobblers, Okonow told them, and they had worked hard. Most had arrived by boat in New York or Boston with $5, $10, or $20; the largest sum any family had brought was $50. Maps showed that within just a few years, some had become landowners. Okonow and other leaders have hopes for this modest building, the only Jewish historical site in downtown Boston. A project is in the works to restore murals buried under peeling beige paint. The shul’s board hopes to make the building more handicapped accessible, and to offer more programming. They invited the descendants to get involved, to join the shul’s board or one of its committees, to attend one of its many programs. Cynthia Winn Jartman, 79, of Peabody, had known and adored her paternal grandfather, Max Winisky, but he did not speak much English, and he died when she was in the eighth grade. Naomi Allen, of Brighton, had been to services at the shul twice before, but she had never known that her grandmother, Rose Galvin, had been a member. Oshry, an educator who grew up in Dorchester and Mattapan, knew his father’s family had roots in the neighborhood; his father had owned a dry goods store nearby, and Oshry had even worked there as a youngster. But he had never known the shul existed. 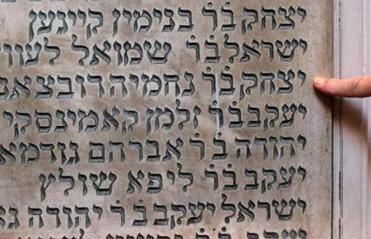 And there was his grandfather’s name, in Hebrew, etched on a plaque high on the wall. “I can’t tell you how many times we’ve walked up and down Beacon Hill, and we’ve never come by this synagogue,” he said.